The year is almost half over and yet it seems like it’s just begun. Our garden is in full effect. Reservations are filling in. Emails keep popping up… We have been really busy especially after our garden party a couple weeks back and all the fabulous press we have been getting. This weeks guest were extra special and the conversations at the breakfast table have been inspiring. What I’ve noticed is the majority of our guest have one thing in common, they all want a greener and brighter future. Its incredible to think that because we promote sustainable hospitality how many different people from all over the world seek us out because of this unique quality. I get excited when I take guest on our tour and show them where our compost is and what our garden looks like and go into detail of what we are doing in the future to improve our sustainability (such as a rooftop garden on our garage). Of course I only go into detail if the guest seem interested, if someone starts yawning I usually take that as a sign to show them where their room is and offer them a glass of wine. Then I started to think, if you could put any ten people around the breakfast table (famous or not) who would it be? What would you serve them? And what would the topic of conversation be? I think this is one of those desert island questions which to me are always fun to answer and hear what other peoples choices are. I also decided to post it up on Twitter and Facebook today. Can’t wait to read everyone’s comments. 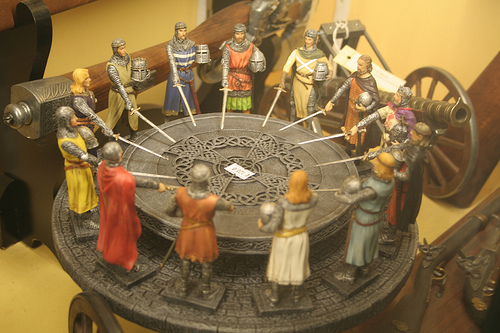 My answer is for people the Knight of the Round Table, minus three knights that is. I would serve them french toast with fresh blueberries on top, scrambled eggs, and roasted potatoes (ha this is what I’m making for breakfast tomorrow), and the conversation would be ‘Michael Jackson or Prince’. Yup these are the things I think about as I run around the inn. I think everyone here at the Queen Anne is really excited about all the media attention we have been receiving, especially after our 1st Annual Garden Party. Modern in Denver was the first to publish a little blurb, then came almost all the Egotist from NYC to LA and even Chicago, and tomorrow SF Egotist will be publishing an article as well! Last Saturday Milan (the owner) and I had huge grins on our faces when we read the Denver Post article about us, the spread had four huge pictures featuring our rooms. There was so much attention for one night of absolute fun that it was almost shocking! All we wanted was our friends and our favorite people in the Denver community to come hang out with us and celebrate the hard work everyone of the artist put into their rooms. Meanwhile enjoying some amazing pizza brought to you by the guys at Beet Box and my favorite beer in the world Great Divide. I will post links at the end of this blog if you are interested in reading any of the articles. Now I would like to give a quick shout out to everyone who was apart of planning the event and also to the rest of our staff including housekeeping (cause they are the best and no one will understand just how hard they work to keep this old Victorian clean) and our groundskeeper. A huge shout out to Baily Rose for curating the rooms and to all the artist who had to stare at the walls of their individual rooms and come up with concepts that would not only impress us but also impress our guest, Josh and Tran Wills, Markham Maes and Natasha Lilipore, Tuyet Nguyen, and Rachel Znerold. They worked so hard and never once complained, instead they only expressed their excitement! Also to Jen Nordhem and Tran Wills who was behind all our media attention, and Tran Wills for setting up this blog and also being apart of the Wills Room. I feel proud to work for such an amazing establishment. For the next blog I won’t be as sappy and I will be writing about the daily life of an Innkeeper, because we have some entertaining stories to tell. I’m also going to include pictures of random things that happen on our property such as pretty flowers blooming in the spring time, and of course FOOD! Thanks for reading this! WELCOME to our quiet, urban oasis in the heart of Downtown Denver,where historical architecture breathes new life. 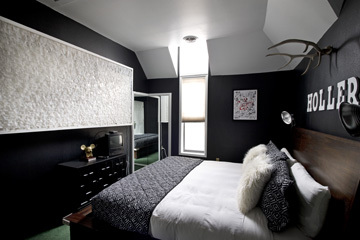 The Queen Anne Bed and Breakfast is a refreshing blend of innovative design with the environment and local community in mind.